The SIGMA 10514 PKR guided-missile frigates are being built for the Indonesian Navy. Image: courtesy of Damen Shipyards Group. The steel-cutting ceremony of the first frigate took place in January 2014. Image: courtesy of Damen Shipyards Group. Keel for the second frigate was laid in December 2014. Image: courtesy of PT Pal Indonesia (Persero). 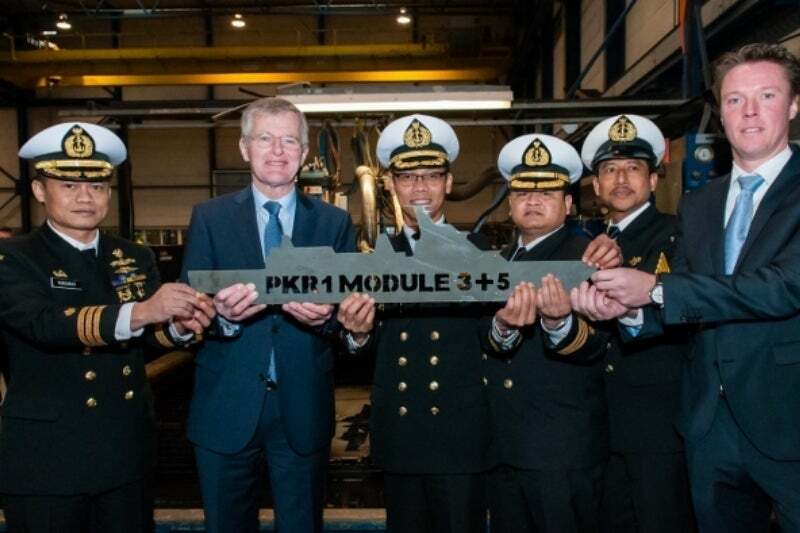 Two SIGMA 10514 Perusak Kawal Rudal (PKR) guided-missile frigates are being built by PT PAL Indonesia (Persero), in collaboration with Damen Schelde Naval Shipbuilding (DSNS) for the Indonesian Navy (TNI-AL). Frigates are designed to perform various missions, including patrolling the exclusive economic zone (EEZ) of Indonesia, deterrence, maritime security, search-and-rescue, anti-surface, and electronic and anti-air warfare. The frigates can also be used for humanitarian support tasks. "Frigates are designed to perform various missions, including deterrence, maritime security, anti-surface, and electronic and anti-air warfare." The SIGMA 10514 PKR guided-missile frigate project was launched by the Indonesian Ministry of Defence in August 2010. The ministry awarded a contract to DSNS for the construction of the first SIGMA 10514 PKR frigate in December 2012. First steel was cut in January 2014, and the keel was laid in April 2014 at lead integrator PT PAL’s shipyard in Surabaya, Indonesia. Four of six core modules were built at Surabaya shipyard, while the remaining two were constructed and tested at Vlissingen shipyard in the Netherlands. The ship was launched in January 2016 and her sea trials were completed in September 2016. It was delivered in January 2017. A contract for the construction of the second guided-missile frigate was signed in February 2013. The first steel was cut in September 2014 and the keel-laying ceremony was held in December 2014. In November 2013, Thales was awarded a contract by DSNS to deliver a full mission systems suite for the first two frigates. SIGMA 10514 PKR’s hull structure is made using grade A / AH36 shipbuilding steel. The ship is 105.11m-long, 14.2m-wide and has a displacement of approximately 2,365t. The fully air-conditioned cabin accommodates 100 crew members and 20 additional officers. An integrated bridge console, which is equipped with an electronic chart display and information system (ECDIS), provides all-round visibility and safe operation. The ship features a helicopter hangar and an aft flight deck with astern fuelling capabilities to hold and operate a 10t helicopter during day and night. It can carry two rigid hulled inflatable boats (RHIBs) for patrol and transport operations. The Talwar-Class guided missile frigate is a modified Krivak III-Class frigate in service with the Indian Navy. The guided-missile frigate is armed with a close-in weapon system, a 76mm medium-calibre gun, two SSM launchers, and a 12-cell vertical launch short-range air defence system (VL SHORADS). Two triple torpedo launchers are provided for anti-submarine warfare. The ship is also equipped with guided-missile systems and gun systems for anti-air warfare, as well as anti-surface warfare operations. Its countermeasure capabilities include two decoys / chaff, electronic support measures (ESM), and electronic countermeasures (ECM). The SIGMA 10514 PKR incorporates STIR 1.2 Mk2 electro-optical (EO) fire control system, identification friend or foe (IFF), KINGKLIP hull-mounted sonar, SMART-S Mk2 3D multi-beam surveillance, and target indication radar. Frigates also feature a LINK-Y datalink, an integrated internal and external communication system and extensive air, surface and sub-surface surveillance capabilities. The onboard Tacticos combat management system designed by Thales integrates the ship’s sensors, weapons and other equipment to provide real-time situational awareness. The frigate’s nautical equipment includes two radars, global maritime distress and safety system A3 (GMDSS-A3) and a reference gyro. The combined diesel or electric (CODOE) propulsion system consists of two 10,000kW maximum continuous rating (MCR) diesel engines, two 1,300kW electric motors, two double input / single output gearboxes, and two 3.55m controllable pitch propellers. Auxiliary units include six 715kWe generator sets, an 180kWe emergency generator set, two redundant distribution chilled water systems, degaussing and fire-fighting system with four main and one service pump.